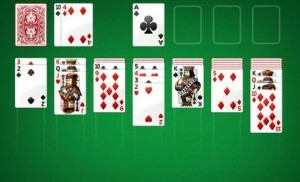 One of the things I like to do on long flights is to play solitaire. It’s mindless enough to allow me to relax, while engaging enough to command my focus, enabling me to shut everything else out. 1. You can quit altogether. 2. You can get upset, frustrated and depressed. 3. Or you can deal again. You can’t change the nature of the game, only your response to it. So if you’re going to play, the key to winning is to keep dealing new hands until you win. Which is why it’s critical to constantly try a lot of things. If one effort doesn’t work, try something else. Change your offer, your price, your approach, your copy, your strategy. Something. Just keep trying. You never know what’s going to work. And often you have to fail an awful lot before you succeed. Failure is never easy, whether you’re talking about a relationship, a business venture or a sales call. But when it happens, remind yourself that often, the cards simply don’t fall where you want them to, regardless of your best efforts. The good news is, you get to shuffle the cards. You get to deal your own hand. And you decide when to deal yourself a new one.